For information about H1N1, visit Fermilab's flu information site. This year, to celebrate the holiday season, Fermilab has decided to try something a little different. The laboratory's inaugural potluck party will take place from 5-8:30 p.m. on Wednesday, Dec. 16. Between 5 and 6:15 p.m., Fermilab employees, retired employees, users, contractors, funding agency employees and their families and friends will gather in the Wilson Hall atrium to enjoy a wide variety of cultural cuisine. Please bring to share an appetizer, main dish or dessert. Foods representing your ethnicity or culture will be appreciated, but are not required. The laboratory will provide non-alcoholic beverages. Anyone bringing food to the event can drop off their dish between 4:30 and 5 p.m. in the Wilson Hall atrium. Volunteers will be waiting, ready to assist in the labeling and placement of your dish. At 5:30 p.m., children from the Fermilab Day Care will sing Christmas songs in the Fermilab atrium. From 6:30-8:30 p.m., the evening's entertainment will take place in Ramsey Auditorium. Rocky Kolb will emcee the event, which will include skits, songs and more. View the program and find out more at the party Web site. There will not be access to the Service Desk's ticket-submission and request system, the Remedy Requester Console, between 6-8 a.m. on Wednesday, Dec. 16. Individuals who log onto the Fermilab network or have Fermilab computers use the online Remedy Requester Console to submit incidents and requests for service. The console will be down to apply operating system and database patches and to complete some network upgrades. Although the console will be inaccessible, requests for service and incident submissions can still be made during the downtime by contacting the Service Desk at x2345. On Tuesday, Jan. 5, Fermilab will start closing the east gate at night from 1 to 5 a.m. Personnel called in during those hours to work on emergency repairs will be provided access. All other employees and users who wish to enter the site between 1 and 5 a.m. will need to use the main entrance on Pine Street. As the laboratory gains experience with emergency repair access during the night, Fermilab management will modify the procedures as necessary. For more information about the new gate, please read the articles published in Fermilab Today on Sept. 24 and Sept. 29. GENEVA, Switzerland, Dec. 11 (UPI) -- Adding Israel and Turkey to the European Organization for Nuclear Research would expand its scientific horizon, the group's director-general said. Barring last-minute political objections, the organization known as CERN could vote this month on whether to approve Israel and Turkey's applications, The Times of London reported Friday. "CERN is globally used. Why not add a global element to its membership?" CERN Director-general Rolf Heuer said. "That is exactly the discussion that we are having at the moment." GENEVA - The world's largest atom smasher produced 50,000 proton collisions at the highest energy level ever recorded, the operators said Monday. The weekend run demonstrated how well the Large Hadron Collider is working in preparation for going to even higher energy level next year for experiments to delve further into the makeup of matter, said Rolf Heuer, director-general of the European Organization for Nuclear Research, or CERN. The new $10 billion machine, which has made a nearly flawless comeback after being heavily damaged during a startup collapse a year ago, was built to examine suspected phenomena such as dark matter, antimatter and ultimately the creation of the universe billions of years ago, which many theorize occurred as a massive explosion known as the Big Bang. "After only three weeks of running it almost felt like routine operation in the CERN control center," said Heuer. Editor's note: The Director's Corner, which normally appears on Tuesday, will run tomorrow. Debbie Harris, MINERvA project manager, wrote this week's column. The first time I saw Particle Physics Division technician Mark Shoun take a MINERvA detector module laying in a flat bed truck, lift all 4 tons of it to a vertical position, and then suspend it above a 350-foot-long shaft, I thought it was magic. Its one thing to know in your brain --and to say in countless talks-- that "the MINERvA detector will operate in the NuMI beam, in front of the MINOS near detector." It's completely another thing to see your beloved 4-ton detector module hovering in mid-air high above the cavern floor. When I saw this for the first time, I was standing next to Jim Kilmer, MINERvA project mechanical engineer, and I asked him if he thought it looked like a miracle. He said, "No. It's not magic. These guys have done this almost 300 times when they installed the MINOS near detector." He tried not to sound thrilled, but I could see the pride for this crew in his face. I was awed again when the crew lowered the module to the bottom of the shaft, where PPD technician John Cornele gently eased it onto a cart and pulled it with an electric fork truck down the long crowded passageway to the near detector hall. There another crane would lift it off the cart and attach it to the detector stand. Once again the disconnect between reality and the words used to describe the process in talks--"like a hanging file folder" --was huge. So many people both at the laboratory and at universities across the country have worked hard to put each 4 ton, precision "folder" together. Since that first trip, PPD's John Voirin and the expert crew he supervises have installed a total of 68 MINERvA modules. Once they install another 48 modules, PPD can add yet another experiment they've made happen to their list. The collective experience of the members of the eight-person crew total more than 200 "man years." Every experiment here owes them a debt of gratitude for the magic they do. 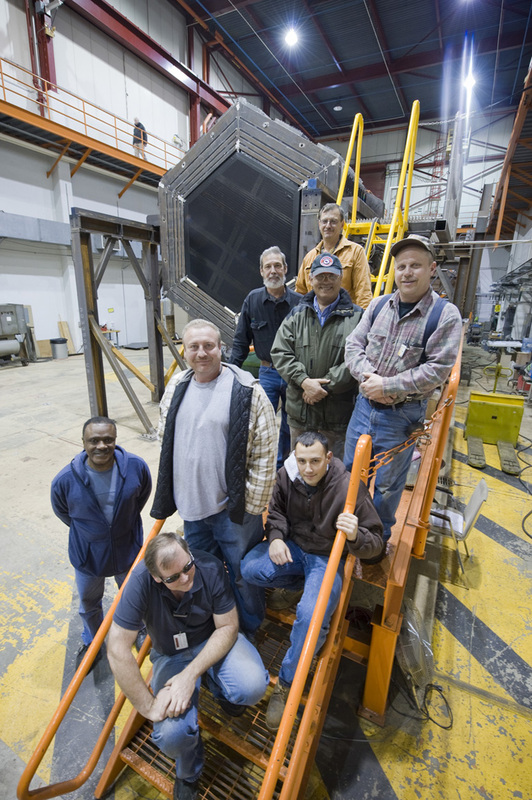 The crew of PPD technicians who install the MINERvA detector. Top, from left: John Voirin. Second row, from left: John Cornele, Koroush Taheri and Mark Shoun. Third row, from left: Chris Richardson, Tom Olszanowski and Steve Ruzzano. Bottom: Andrew Lathrop.